Publishing an obituary of someone who is very much alive is the kind of nightmare editors greatly fear. I have been editing Tanzanian Affairs for 28 years and this is the only time that this has happened. When I realised what had happened I did what governments do when they are in trouble. We launched an investigation! Firstly, I came to the conclusion that this document must have passed through my hands at some stage – at present we are juggling with about 80 different stories for our next issue – but my memory is not what it used to be and I can’t remember. Another quite plausible possibility has been suggested. Someone might have sent us an article about your OBE award in the hope that we would publish it and the document might have got into the wrong file i.e. OBIT file instead of OBE file. But we still really don’t know how it happened. I hope you have already received short apologies from members of our editorial team. We have removed the obituary from our online edition. I am feeling very guilty about the distress that this has caused and must add my apologies as humbly as I can. I have found your exhilarating twitter column (@afrenv – highly recommended reading) and realise how much the world would have been a poorer place if the worst had happened. Sorry I missed you at the WTM in London and hope very much that you will make contact next time you are here. It would be great to hear more about your apparently rip-roaring life. If you would like us to offer you a complimentary half-page advert in Tanzanian Affairs for your company please let us know. 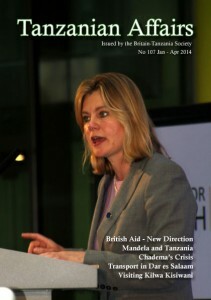 The British International Development Secretary, Justine Greening, signalled a shift towards a more pro-business approach for British aid in Tanzania while visiting the country in November. She was accompanied by representatives of 18 British and international business and social enterprises, including Unilever, JCB (construction equipment), Mott Macdonald (engineering consultants), Diageo and SABMiller (brewers), and Swire Pacific Offshore (oil and gas services). It is the first time DfID has hosted such a delegation. “The Chinese government has invested and it’s time the British government makes sure we’re helping British businesses have that advantage to invest in Africa too,” Ms Greening said. The Department for International Development (DfID) will invest £20m in four new partnerships with businesses and not-for-profit organisations working in Tanzania. DfID will collaborate with social enterprise and business with loans and equity, generating a return that can be reinvested. The largest partnership is with Unilever, the Wood Family Trust and the Gatsby Foundation. DfID will invest £7.5m in “a major new tea plantation” in the southern highlands. A second investment in tea production will go to the Tanzania Tea Packers (TATEPA) Wakulima Tea Factory in Rungwe district. DfID will provide up to £2.5m to fund a hydro-power plant that will reduce energy costs and increase the factory’s productivity. Further investments are to Kilombero Plantations Ltd (£6.7m) to finance a rice husk gasification plant and £3.3m to Equity for Tanzania, to enable small agri-businesses and farmers to access finance for agricultural equipment. 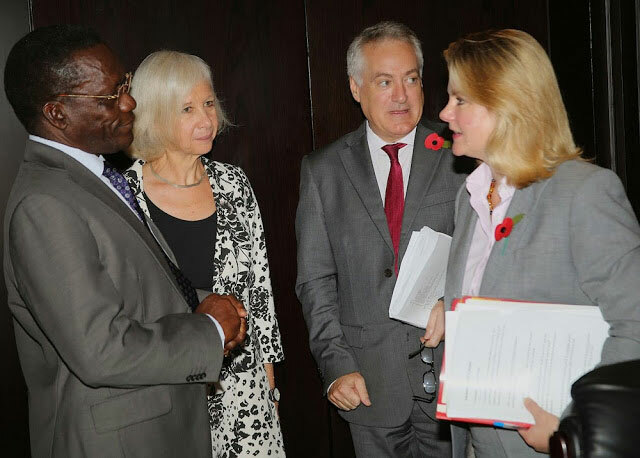 These investments were announced by Ms Greening at the launch of a new High Level Prosperity Partnership (HLPP), which was attended by the Tanzanian Prime Minister, Mizengo Pinda. Tanzania is one of five countries to be part of the partnership, alongside Angola, Ghana, Ivory Coast and Mozambique. DfID hope that the partnership will see the UK and Tanzania create even closer commercial links and will “double the number of UK companies doing business in Tanzania in the renewable energy and agriculture sectors by 2015.” The partnership will focus primarily on four sectors: oil and gas, renewable energy, agriculture and strengthening business environment. The London Stock Exchange Group will provide training to financial professionals, regulators and government officials in Tanzania. Prime Minister Pinda expressed his hope “that this Partnership will open a new window of opportunity to these important areas of cooperation”. Later in her visit, Ms Greening announced initiatives aimed at reducing transport costs within East Africa. Following a visit to the Dar es Salaam port, she launched a £10.5m fund to support a scheme run by TradeMark East Africa, called the Logistics Innovation For Trade (LIFT) fund. The LIFT fund will provide match grants to encourage private sector investment in freight and other logistics technologies and busi­ness processes in East Africa. The aim is to reduce transport time along the main transport corridors in East Africa, stimulate further research and create systems for tracking industry performance and efficiency. East Africa currently has some of the highest freight and transport costs in the world. The new approach has attracted criticism that it would benefit the wealthy more than the poor. Christine Haigh, from the World Development Movement said: “It’s clear that this initiative is very much about finding new markets for UK companies and very little about reducing poverty for the majority of Tanzanians”. The move is the latest evolution of British aid policy in Tanzania since the Conservative-led coalition took office in 2010. There was a reduction in the aid provided as General Budget Support (from 66% in 2010/11 to less than 30% in 2013/14), but an overall increase in total aid linked to the promise to spend 0.7% of British GDP on aid. In 2010/11, DfID spent £150m in Tanzania and this will rise to £192m in 2014/15. When Chinese President Xi Jinping visited Tanzania earlier in 2013, he signed a $500m bilateral trade deal with Tanzania and agreed a $10bn investment in a new port in Bagamoyo. The death of Nelson Rolihlahla Mandela has drawn tributes from the great and the good (and the not so great or good) around the world. Presidents Barack Obama and Jacob Zuma understandably drew the most attention. “The people of Tanzania would like you to know that you are not alone. They are with you during this difficult period and mourning. They are saying your grief is our grief, your loss is our loss. Nelson Mandela was our leader, our hero, our icon and our father as much as he was yours. The people of Tanzania have lost a great friend and great comrade in arms. “President Mandela had long standing association with Tanzania. It dates back to the times of the struggle for independence and liberation here in South Africa and in Tanzania. We supported each other at the time of need. It was no accident, therefore, that after the ANC decided to establish the armed wing, the Umkotho we Sizwe, after peaceful means seemed to be futile, Dar es Salaam was Madiba’s first port of call in 1962. He left South Africa secretly and came to newly independent Tanganyika to seek support for the armed struggle and a place to train the MK combatants. 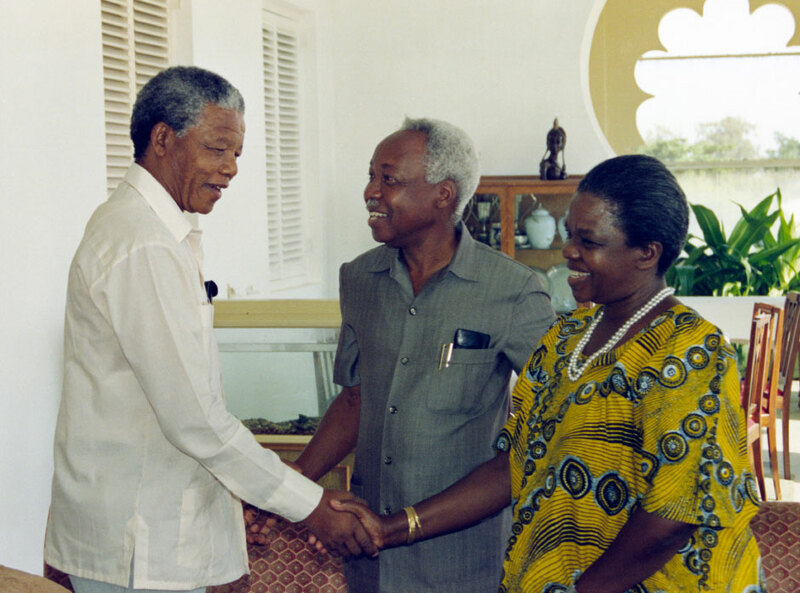 “Though at first President Nyerere had some reservations about when and how to initiate the armed struggle, he accepted Madibas’ request and provided members of the MK both permission to live in Tanzania and places to train. I am sure to the ANC and MK veterans gathered here, names like Kongwa, Mgagao, Morogoro, Mazimbu and Dakawa sound familiar. They may even rekindle nostalgic memories of the life they lived in Tanzania. “Besides that, Tanzania was generous enough to give cadres of the liberation movements travel documents – passports and all that is needed. Where necessary, they assumed Tanzanian names. When Madiba came to Tanzania he had no passport. He was given a Tanzanian travel document. It facilitated his movement. And I know a number of you used Tanzanian travel documents – I don’t know if Thabo returned his? “There is another interesting thing about Madibas’ first visit to Tanzania in 1962 which I would like to mention. In order to keep the visit discreet, he did not stay in hotels; he stayed at the home of TANU’s Treasurer who was then the Minister for Commerce and Industries Mr Nsilo Swai. On his departure to his onward trip to Accra, Lagos, Addis and Algiers, he left his boots at Mr Swai’s home in the hope that on his way back he would pick up the boots. Unfortunately, he did not pass through Dar es Salaam and shortly after arriving back in South Africa, Mandela was arrested and imprisoned and spent the 27 years in Robben Island. “Fortunately, the Swai family kept the boots awaiting his return. In 1995 when Madiba was President of the new South Africa, the pair of brown boots was handed back to him by Mrs Vicky Nsilo Swai the widow of the late Nsilo Swai who died in 1994. “I have narrated these stories and anecdotes to let people know how far back, the present excellent relations between our two friendly countries and both the ANC and Chama cha Mapinduzi have come from. It is not by accident that South Africa and Tanzania enjoy excellent bilateral relations. We are close friends and allies because our common history unites us. – how do you join a multilateral organisation aiming to bring neighbouring countries together in the common interest without sacrificing important parts of your own sovereignty? In Europe, Britain was originally forced to delay its entry into the European Union because another member state, France, objected that the country was not ‘European enough’. Then Britain was allowed to enter and it subsequently signed several treaties which were clearly aimed at the ultimate creation of a European Federation. It was many years before Britons began to understand what was happening and how its sovereignty was being undermined. But at the same time, for many the EU offered attractive features in trade and free movement of people that Britain did want. Over the years the Conservative party almost broke into two on the issue and the anti-EU UKIP party rapidly gained support. The British government has now decided to hold a referendum in 2017 (if it wins the election in 2015) on whether Britain should abandon its close ties with the other EU countries and go it alone. To the surprise of many, and quite suddenly, Tanzania finds itself facing the same kind of dilemma as Britain, and also a growing isolation. Kenya, Uganda and Rwanda have become known as the ‘Coalition of the Willing’, pushing ahead with political, economic and infrastructure projects, leaving Tanzania side-lined from important discussions. Tanzania was not invited to (or decided to stay away from) several recent EAC meetings. As this issue of TA went to press the ‘Coalition’ were discussing the draft of a federal constitution. Many Tanzanians believe (not without some justification) that Tanzania is not like the other EAC members, so during recent months the government has been trying to put a brake on the rush towards a political federation. At the end of October East African Cooperation Minister Samuel Sitta said that any decision concerning the EAC federation reached only by the ‘willing countries’ would not be recognised by Tanzania. On 7 November, as the crisis escalated, President Kikwete told parliament that Tanzania would never quit the East African Community, and called on her neighbours to be more accommodating. “We have come too far… to give up now….Tanzania has done nothing wrong against any EAC member state…. some leaders are said to be accusing Tanzania of dragging its feet on the integration of the EAC…..we do not have problems fast-tracking the proposed Federation. But this must be done according to the ‘Federation Protocol’…. nowhere is it said that we should skip any of the preparatory steps. But these friends of ours have decided to do so. We want to avoid what happened in 1977 [when the first EAC collapsed].” In an echo of the European Union controversy, he added: “We must bear in mind that economic gains are among the attractions for member states to remain members. If this is not done the political federation will be under threat”. The Ugandan newspaper New Vision in October listed other ‘sticking points.’ They included Tanzania’s recent expulsion of refugees; its imposition of a 35% increase in work permit fees on residents of other EAC states; a $200 fee on vehicles crossing into its territory; and its opposition to the use of national identity cards as travel documents within the EAC (because Tanzania had not completed issuing these documents to its own people). In early August – in the East African Legislative Assembly, which meets in rotation in member countries – some members had wanted to oust the Tanzanian Speaker who was alleged to favour meeting permanently in its Arusha HQ as a way to save money. Some observers believe that there is a power struggle going on. Kenya’s economy has always been stronger than the other EA countries, but things are now changing. Foreign investment in Kenya now lags well behind Tanzania and Uganda. 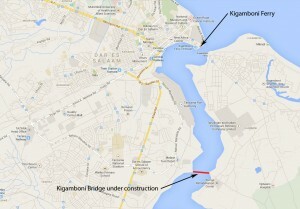 Tanzania benefitted from its much longer trade relations with China, dating from when China constructed the TAZARA Railway; and China has now agreed to finance a massive port at Bagamoyo with a capacity far greater than Mombasa and Dar es Salaam put together. Kenya needs a ‘coalition of the willing’ to hang on to the huge trade prospects in Uganda, Rwanda, Burundi, the DRC and now South Sudan. The first meeting of the Presidents of Kenya, Rwanda and Uganda, without Tanzania, was in Entebbe in June 2013; the second in September in Mombasa. 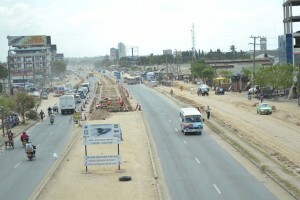 It was revealed that, for Tanzania, land was the major issue. The country has just over half of the land mass of the EAC but less than half under agriculture. With a population explosion under way, Tanzania feared that, under a new Federation, there could be great pressure on it to open its gates to workers from neighbouring countries and its land to foreign buyers or leaseholders. Tanzanian columnist Jenerali Ulimwengu wrote in The East African newspaper that moving ahead on EAC integration without Tanzania would amount to trying to “stage Hamlet without the prince”. He also said: “Some of us fear the dream of integration of our countries is in danger of being dashed once again….Our leaders need to stop singing themselves lullabies. If they cannot engage with their natural partners, they will not be able to engage with the artificial ones they have tried to cobble together,” (referring to suggestions about Tanzania’s approaches to the members of the Southern African Development Communty (SADC) as an alternative to the EAC). Ugandan journalist Paul Busharizi wrote in New Vision: “Whatever the reasons at the top, the people of East Africa would hate to see the Community break up again”. In The East African, Tanzanian columnist Elsie Eyakuze wrote that “It is hard to tell how we have fallen into this area of mild disgrace….we are steadily dropping off every popularity chart imaginable”. Like the UK in Europe! The original East African Federation came into being in June 1967. It established joint ownership and operation of services managed by the East African Railways and Harbours; the East African Airways; the East African Posts and Telecommunications; the Inter-University Council for East Africa; and the East African Currency Board. There was also a Court of Appeal for East Africa and an East African Legislative Assembly. It ended when Idi Amin seized power in Uganda and when Kenya became more capitalist and Tanzania more socialist. 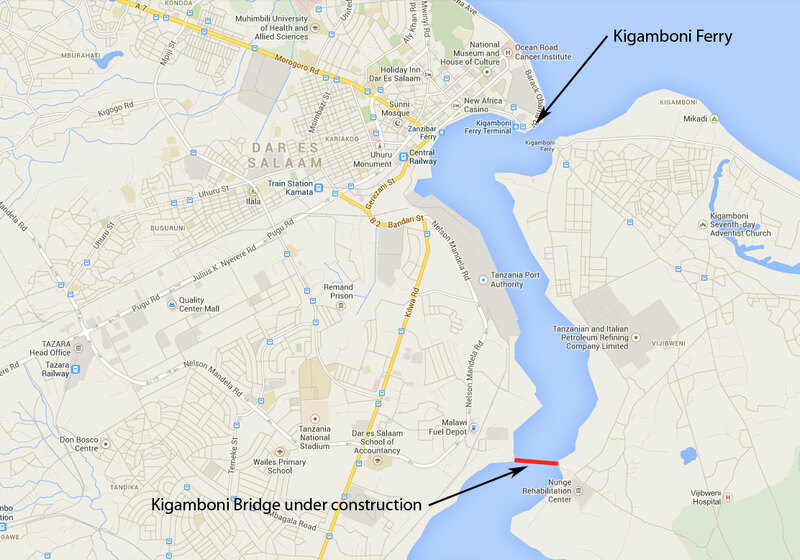 Although the EAC is in stormy waters at present, it has some positive achievements to its credit. It has set up a Customs Union and a Common Market. In November it was due to complete a ‘Single Customs Territory’ and work is underway on a Monetary Union. This will be implemented over 10 years, with a single currency to be launched at the last stage, which will culminate in the integration of member states’ financial markets. At an extraordinary summit meeting attended by all five EAC Heads of State in Kampala on November 30 some progress was made in bringing Tanzania back on board. Tanzania argued that its slow decision making was dictated by the need to get input from its citizens. However, all five presidents signed a Monetary Union Protocol and agreed that all the partner states should conclude the ratification of this by July 2014. They also agreed that the East African passport be launched on November 2014. According to the Uganda Sunday Monitor, the Tanzanian President sat closest to his Burundian counterpart throughout the summit. All participants agreed that it would be necessary to sensitise East African citizens about the benefits of the Union. President Kenyatta said ”Let us all put an end to unnecessary rumour mongering” and President Museveni was said to have lashed out at people who employed tribalism and religion to divide the population. But, in spite of this, Tanzania has now announced officially that it is starting a new economic partnership with Burundi and the Democratic Republic of the Congo (DRC). The three countries met in Burundi and agreed to develop road, rail and water transportation infrastructure. Meanwhile Kenya with Uganda and Rwanda (now plus South Sudan) has launched a plan to develop a new 500-kilometre standard gauge railway line starting in Mombasa. The East African is now writing about two competitive ‘coalitions of the willing’ as a possible blessing in disguise to trigger faster development in all seven countries. In November the Bank of Tanzania released data for October 2012 to September 2013, which shows an increase in tourism earnings from US $ 1.61 billion to US $ 1.82 billion. Tourism is now the strongest performing economic sector in Tanzania, outstripping all other sectors including gold mining, which had claimed top spot a year ago at a time of record high gold prices. One piece of good news for the Maasai population of Loliondo, if not for the directors of the Ortelo Business Corporation (OCB), was reported by David Smith in the (UK) Guardian on 7 October, when civil society groups claimed that the Tanzanian government has dropped its plans to annex 1,500 sq km in the Loliondo Concession for a ‘wildlife corridor’. Although it should be noticed that no statement has been made by the Tanzanian government on the issue, Samwel Nangiria, coordinator of the local Ngonett civil society group, described how Prime Minister Pinda spent two and half days in Loliondo in September with the Maasai, who reiterated that the land in question must not be annexed. The Maasai leaders are now in discussions with lands ministry to update the legal status of their land holdings. If this report does turn out to be correct, the successful model of internet-based, international protest, combined with well-organised and politically engaged local opposition, may be followed by other groups threatened by large scale land appropriation. Another Tanzanian government large scale development plan received bad news in November when the National Development Corporation (NDC) published the results of the eight-month scientific study into the environmental impact of the construction of the Lake Natron soda ash extraction plant. Their dramatic conclusion was that President Kikwete’s directive to proceed with the construction of the plant would ‘almost certainly wipe out East Africa’s lesser flamingo population’. The study demonstrates how the mud flats of Lake Natron are the only place in East Africa where the lesser flamingo can breed. The construction of the soda ash extraction plant would disrupt the movement and feeding patterns of the birds so severely that a secure future would not be possible. By linking the project to the destruction of a species that has great significance for both Tanzania and Kenya, the NDC has placed a for­midable obstacle in the path of the Tanzanian government, who have dismissed previous opposition as “the work of the mzungu”. The poaching of elephant and rhino for their tusks and horn continues to be a tragic issue across Africa. Tanzania is suffering its sad share of the losses, although the extent is uncertain. In November alone, two large seizures of ivory were made in Dar es Salaam and Zanzibar. The Dar seizure weighed over 1.9 tonnes and was estimated to comprise ivory from 200 elephant. Submerged in a strong smelling concoction designed to prevent detection, it was found in the residence compound of three Chinese living in Dar. The recent wide-scale anti-poaching operation using Ministry of Natural Resources personnel, police and members of the TDF, code named ‘Tokomeza’ has been criticized as badly managed. Individuals were given the chance to settle personal scores and human rights abuses were committed. It was asked why so much activity occurred in northern Tanzania, in the vicinity of the Serengeti National Park, when the majority of the poaching occurs in the remote areas of the Selous Game Reserve. There are unverified reports that Tokomeza has been active in the Selous with a similar ruthless efficiency, but, as ever, stories from that area are difficult to corroborate. The recent emergence of FastJet as a low cost airline continues to shake up the domestic scene, offering one-way tickets from Dar to Arusha, Mwanza and Mbeya for as little as TSh 32,000. This price is comparable with bus fares, and brings the cost of flights within range for a much larger number of Tanzanians. In what could become the biggest overhaul and expansion of Tanzania’s rail network for a generation, several schemes are in various stages of development. This has been prompted in part by China’s re-emergence as a major player in Tanzania, and in part by political and economic competition within East Africa. 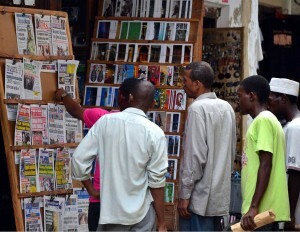 On 9 October the Government placed a 14-day ban on publication of the popular Swahili newspaper Mwananchi and a 90-day ban on Mtanzania. They were alleged to have published classified information and “seditious articles likely to provoke incitement and hostility with the intention of influencing the public to lose confidence in state organs and create disharmony”. The government referred specifically to two articles in Mtanzania, headlined ‘Presidency through Bloodshed’ and ‘Revolution is Inevitable’, and to the publication of a confidential document on government salary structures in Mwananchi. As Tanzania is widely regarded as having a relatively free press compared with other countries in the region, there was immediately a huge outcry. The executive secretary of the Media Council of Tanzania (MCT), Kajubi Mukajanga, said: “The steps taken by the government are very unfortunate and undemocratic and have taken the country decades back in its endeavour to build a democratic society which respects freedom of expression …… an assault on the press is an assault on democracy.” He advised the government to pursue other avenues to redress what it perceives as misrepresentation by the press including dialogue, feedback and the use of the mediation services of the MCT. Among others expressing strong disapproval were the European Union, US Ambassador Leonhardt and a coalition of 50 human rights organisations. The Uganda Monitor said ‘governments should at all times show that they have nothing to hide’, while the Legal and Human Rights Centre and media stakeholders declared a media blackout on the Minister of Information and on the Director of Information Services. TSh 150,000 to TSh 5 million. Parliament rejected this amendment, calling instead for a new bill to replace the 1976 Newspaper Act. Meanwhile, in Britain, wrangling continues between the government and the media over proposed press controls. The media would prefer to control itself but the government is insisting on some element of control by the government to curb excesses by the more popular papers. The ruling CCM party has been remarkably successful for almost fifty years through tight discipline, dealing with dissident elements internally and behind closed doors. It has never been defeated in a general election. Prospects for CCM to maintain this record in the next election, in 2015, look strong. The leading opposition party, Chadema, which had been growing in strength for several years, is now in crisis. In dealing with its most dynamic, charismatic and ambitious young MP (for Kigoma North), Zitto Kabwe, the policy has been to give him more and more responsibility. He is (or was) deputy secretary general of the party and its deputy leader in parliament. He is also shadow minister of finance and chairman of parliament’s finance committee (and other important committees). It was a surprise therefore when, in November, he and two other senior party figures were stripped of all their positions except party membership. They were accused of eleven offences and preparation of a secret ‘conspiring manifesto.’ They were given until mid-December to explain why the party should not expel them. There followed the resignations of Ally Chitanda, secretary in the office of the party’s secretary general (who complained about religious segregation, tribalism and excessive payments to executives) and Said Arfi, national vice chairman of the party. CCM had greatly feared the increasingly strong Chadema party, but its members and supporters are likely to have a more merry Christmas after these startling events. Agriculture forms the bedrock of Tanzania’s economy – it accounts for more than one quarter of GDP, provides 85% of exports, and employs about 80% of the workforce. Yet while the country currently has 29.4 million hectares of land that could be irrigated, only 589,245 hectares are actually being irrigated. The National Irrigation Act 2013 is intended to give agriculture a new lease of life as global weather patterns change. In order to protect the farmers from extreme weather patterns and climate change, Tanzania’s parliament has passed this law aimed at improving irriga­tion and thereby food security, and reducing poverty. The Minister for Agriculture, Food Security and Cooperatives stated that by 2015, at least 25% of food production should come from irrigated land. The new law establishes the Irrigation Commission, a national body with the mandate to co-ordinate, promote and regulate irrigation activities across the country. There will also be an Irrigation Development Fund created to help irrigation schemes, many of which suffer from financial strain at present. This fund will be used to finance irrigation activities carried out by individual farmers and investors through loans or grants. The law will also establish a system enabling farmers’ groups, individuals, associations and companies to own government-built irrigation infrastructure. One of the projects of DfID (UK Department for International Development)’s new phase of investment in Tanzania is a £7.5m project investing in tea farming in the southern highlands of Tanzania. DfID said the investment would boost the income of more than 3,600 tea farmers in 27 villages. A further £6.7m will be invested in Kilombero Plantations, a public-private partnership focused on developing the region’s agricultural potential and fostering inclusive, commercially successful agribusinesses aimed at benefitting small-scale farmers. DfID will also sign a £2.5m agreement with Tanzania Electric Supply Company to build a hydropower plant that is expected to boost energy production at Tanzania Tea Packers. The Mara Regional Commissioner (RC), has encouraged herders to realise the benefit of dipping livestock as a means to help make the sector more profitable allowing them to transform their lives. “I consider livestock keeping as one of the most important things,” he told herders at the rural village of Surubu in the Northern Tarime District recently. He visited the village cattle dip and pledged to support a group of herders taking care of the dip. “Cattle dipping will help prevent ticks from attacking cows, hence improve livestock products,” he explained. He also emphasised the importance of adapting livestock artificial insemination in the region. “Our aim is to invite investors on livestock products and we want the people to change from traditional livestock rearing to zero grazing,” he said.